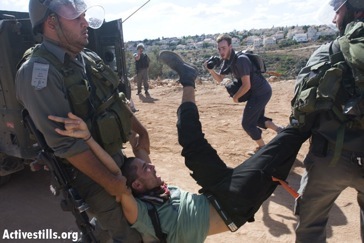 On Friday morning 10th October, residents of Ni’lin village went out to harvest olives on their land, supported by about 100 Israelis and international activists, and also accompanied by media crews. 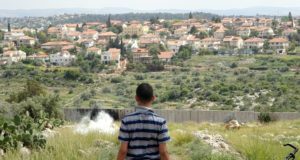 The proposed route of the wall cuts deeply into this land, and will cut villagers off from a whole valley full of olive trees belonging to the village of Ni’lin. 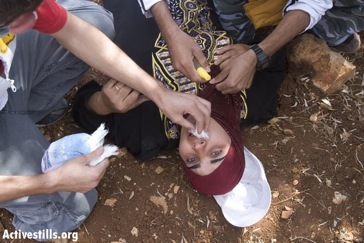 Ten people were injured, two of them children, as the Israeli army violently tried to prevent the activists and farmers from reaching their land. Two Palestinian ambulances were also shot at with tear gas. 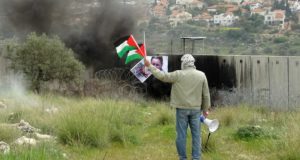 As people approached the planned route of the wall, soldiers appeared firing sound bombs and tear gas without warning, to prevent anyone from getting to the olive trees beyond this point. Sound bombs and tear gas were thrown very close to people who were standing peacefully and sitting down. Tear gas was then fired from a gun aimed directly at activists who had gone up to the front of the group, and also at farmers who had begun their harvest in an area further away. 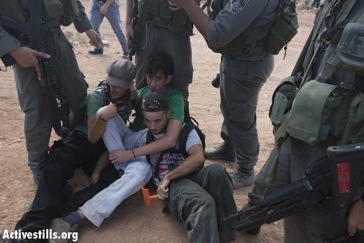 Three Israelis protesting peacefully were forcibly dragged away and detained. 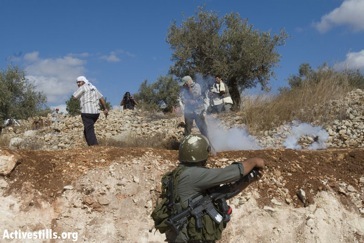 One Palestinian man, Omar Salfi, was injured when the tear gas caused him to fall out of a tree. 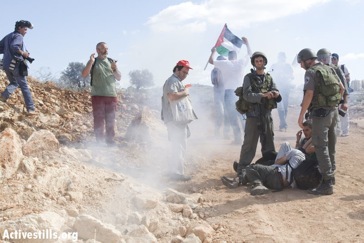 The the farmers and activists were pushed back, but after Israeli activists had negotiated for some time with the army, they were allowed access to the olive trees between the planned route of the wall and the Israeli settlement on the top of the next hill. 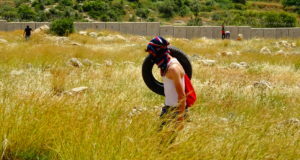 The village of Ni’lin has been badly affected by the attempt to construct part of the wall there, which would cut off many local farmers from their land if built. 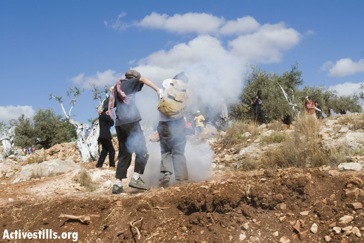 Peaceful demonstrations against the construction of the wall by residents and activists take place in Ni’lin regularly.